Elementary School T-Shirts (846) Questions? 1. We send you an order form to send home with your students. 2. You mail us the order forms after you have collected them. 3. Shirts are individually folded and placed in a clear bag along with the student order form. 4. We ship the order in bulk separated by sizes. 5. Voila! You can now easily and quickly distribute the shirts throughout the school. 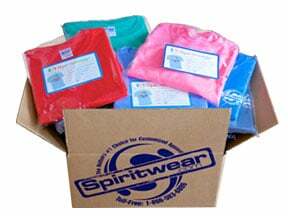 Dare to be different this year with some Custom Printed Elementary Spirit School T-Shirts from Spiritwear.com. We offer a variety of different Elementary School Spirit Shirt Designs that can all be customized to fit your needs or submit your idea to our art department to have a totally customized elementary School Spirit Tee Shirt Design created. Visit our Contact Us page today to make a school spirit tee shirt. Thank you Barbara. You're awesome!